I bet you’re wasting more cash on cosmetics than you realize. This is especially true if you love the latest trend of all-natural masks, facials, hair treatments, scrubs, and other remedies. It’s easy to throw away money on these products while you’re out shopping, and when so many of them are actually made with harsh alcohols and dyes as opposed to beneficial ingredients, they are incredibly harmful to your skin, making them a total loss. Don’t make a special trip to the store to pick up an “all-natural” or “organic” mask or body scrub. Instead, just walk right to your pantry and grab the ingredients to create the same thing, minus the nasty, counterproductive chemicals. There will be no travel time involved, no gas money spent, no fighting store crowds, and no money thrown away on products that probably won’t even work. Combine all the ingredients into a container and mix thoroughly until everything is blended together. This scrub will leave your skin feeling smooth and supple, while leaving it moisturized, free of itchy dead skin, and smelling amazing. It will also help fight acne because of the antibacterial properties in honey, and its abrasiveness does the job when it comes to getting you clean. I alternate between using scrubs and body washes to maximize my savings. It pays off when a typical cinnamon scrub that claims to be “all-natural” with “no chemicals added” can cost up to $20. You can even experiment to create all types of scrubs that fit your needs. Try salt instead of sugar. Use different types of oils and incorporate dried herbs and citrus zests. Even use baking soda with a carrier oil, apple cider vinegar, and lemon juice for a powerful acne fighting facial scrub. The possibilities are endless. Mix all the ingredients together and apply evenly from root to tip. Wrap your hair up (a shower cap works best) and let the mask sit for a minimum of one hour. Rinse thoroughly with warm water and wash your hair as normal in the morning. This mask is terrific for dry, damaged hair. It is also great if you use heat styling methods frequently or if you want to grow your hair out in a hurry. I was able to use this mask to add tons of new growth to my distressed hair without paying a fortune. It will help repair and protect your hair to keep it growing, while adding a beautiful shine and making it feel silky and soft. This is another recipe with which you can easily experiment. Consider trying aloe vera or apple cider vinegar. Or try different hair-healthy herbs like lavender, nettles, or mint. With some designer hair masks costing upwards of $50, this is beauty remedy straight from the kitchen that will save you time, effort, stress, and money. Homemade scrubs and beauty remedies offer so much more than just savings. It’s a fun, creative hobby that keeps you looking vibrant, and sometimes these beauty remedies can even bring in extra cash. Why not set up a farmers’ market booth and sell your crafts there? Scrubs especially make great gifts, which can save your wallet even more, and every time you use a homemade beauty product, put the extra cash you would’ve spent aside. You’ll literally see the savings pile up. Make life a little less expensive, and make your beauty treatments and cosmetics in the kitchen. Take the Next Step: Give your finances a good makeover. 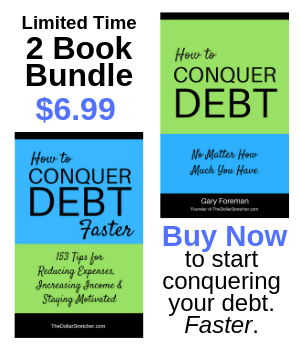 Our ebook How to Conquer Your Debt No Matter How Much You Have can provide you with the tools you need to wash away debt and beautify your budget.